Williams, wearing headphones, quickly pivoted and retreated back into the tunnel she’d just emerged from, making way for her fourth-round opponent Monday night. A couple of hours later, when Williams wrapped up her 6-1, 4-6, 6-4 victory over Halep in a contest filled with momentum swings and fantastic play by both, it was clear which woman really is No. 1, regardless of what the current rankings say. 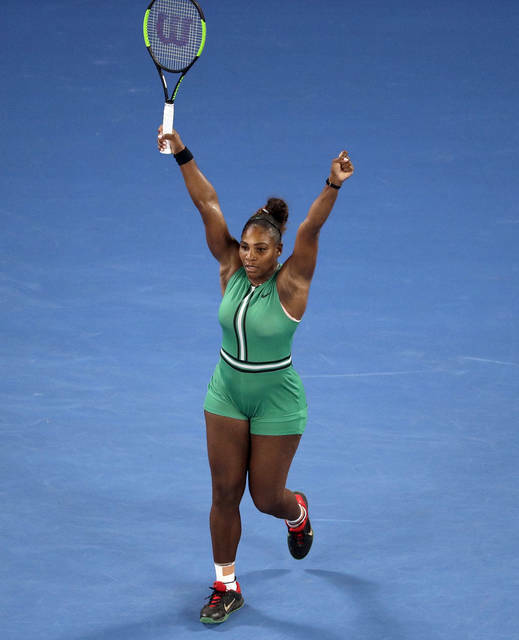 The 37-year-old American sat out last year’s Australian Open after giving birth to a daughter months earlier and dealing with health complications. 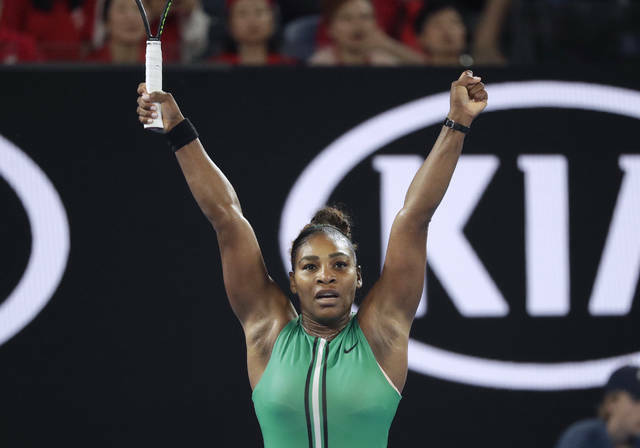 Since returning to the tour, Williams has reached the past two Grand Slam finals, losing both — and leaving her still one shy of equaling Margaret Court’s record of 24 major singles titles. 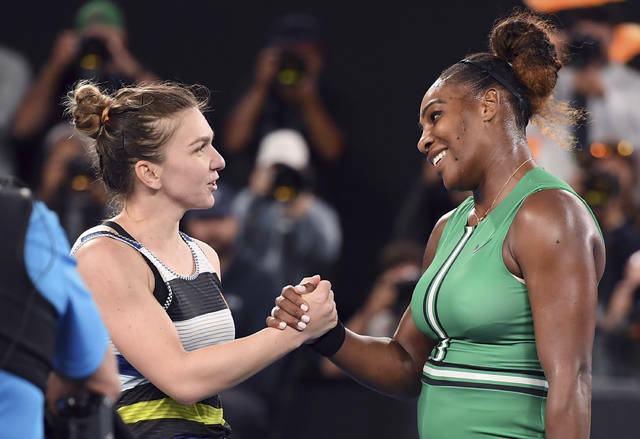 Halep offered up the first real test Williams has faced at this year’s Australian Open, where she is bidding for an eighth trophy, pushing her throughout a back-and-forth matchup that was a fascinating mix of power, court coverage and shotmaking. It wasn’t until Williams saved three break points in a monumental game to hold for 3-all in the third set that she gained control. “I was unlucky a little bit,” Halep said. Williams then broke for a 4-3 lead and finally was on her way. That she does. She also makes abundantly clear just how much every point means to her. Pliskova advanced earlier Monday with a 6-3, 6-1 victory over two-time major champion Garbine Muguruza. The other quarterfinal on that side of the women’s bracket features No. 4 Naomi Osaka against No. 6 Elina Svitolina. Osaka, who beat Williams in last year’s U.S. Open final, edged No. 13 Anastasija Sevastova 4-6, 6-3, 6-4 in the fourth round, while Svitolina got past 2017 U.S. Open finalist Madison Keys 6-2, 1-6, 6-1. In men’s matches, 2016 Wimbledon runner-up Milos Raonic knocked off No. 4-seeded Alexander Zverev 6-1, 6-1, 7-6 (5), and next takes on No. 28 Lucas Pouille, a 6-7 (4), 6-4, 7-5, 7-6 (2) winner over No. 11 Borna Coric. No. 23 Pablo Carreno Busta left the court yelling at the chair umpire after a disagreement in the concluding tiebreaker of his 6-7 (8), 4-6, 7-6 (4), 6-4, 7-6 (8) loss to No. 8-seeded Kei Nishikori in a 5-hour, 5-minute marathon that was the longest match of the tournament. Nishikori’s quarterfinal foe will be No. 1 Novak Djokovic or No. 15 Daniil Medvedev. Williams and Halep traded jittery breaks of serve in the opening two games, as each double-faulted and flubbed shots. But Williams settled down first, compiling a 10-3 edge in winners to grab the opening set. Halep then fell behind by a break in the second, before suddenly seeming to awaken and display her own brand of baseline talent that carried her to the Australian Open final and French Open championship in 2018. Halep made only 12 unforced errors in the entire match, and that clean play got her back into things, especially as Williams’ miscue count rose to a final tally of 31. That dated to the start of Williams’ run to the 2017 title, which she won while pregnant. Because this was a night match, her 16½-month-old daughter, Olympia, couldn’t stay up to watch, Williams said, adding: “But we’re going to have a fun morning tomorrow” watching films. Williams joked she’s seen “Frozen” and “Beauty and the Beast” several thousand times apiece.